*Looks like Rihanna’s not the only one in her family who can’t quit Chris Brown. Fenty says he has “no problem” with the couple rekindling their relationship. “I think everyone makes mistakes and they shouldn’t be held to them forever,” Fenty remarked. I completely agree! Even the worst of abusers present a charismatic front. Glad he’s not my daddy! 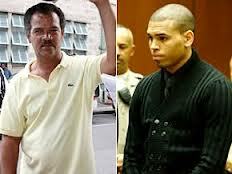 Rihanna’s Father “I love Chris Brown, Man” This is new news to me. Punk a_ _ b*tch Chris Brown had bit Rihanna’s ears & fingers as he badly beat her. With that said, how many father’s of a daughter still likes the boyfriend or husband that has beat his baby girl like an animal? You damn skippy something is seriously wrong with that picture. Chris dumps current girl to rekindle their friendship with Rihanna. So watch out for part two. Next time Chris will bash her head in cement. Rihanna ridiculously very dumb & crazy to even want to get back with him. Has everyone forgotten that the initial eyewitness reports said that she attacked him first? Chris had poor legal representation and was also a victim of the new P. C. That being said, the next time he should give that garden tool a pass and pimp smack her dad.